Since its founding just before the start of the Civil War, the Academy has been a vital source for effective and, often, radical thought and action regarding the healthcare and public health problems that affect people in New York City and beyond. At the time of its founding in 1847, New York City had been facing turmoil in medicine and public health on many fronts. Traditional methods of medical practice were often more traumatic than the diseases themselves; avoidable infections were taking a powerful toll on lives in the best hospitals, and one in three women were dying in childbirth. Community health conditions were appalling, with 50 percent of children dying before the age of one. A group of eminent physicians decided that reforms were needed and established the Academy for “the advancement of the art and science of medicine, the maintenance of a public medical Library, and the promotion of public health and medical education.” These efforts would lead to the creation of the city’s first sanitation and public health departments, a system that would be replicated all over the nation. Moreover, the Academy was integral in the development of tracking births and deaths, a move that ultimately led to the creation of a Medical Examiner’s Office. In the years to follow, the Academy would serve as the vanguard for urban health, addressing the most pressing health issues in New York City, from the continued concerns of maternal mortality and the health of vulnerable populations to the current epidemics of obesity and asthma, all the while supporting medical and health scholarship through our Library and Fellows program. The Academy’s rich history of influence and action in urban health has led to our current agenda, which focuses on the three core areas of healthy aging, disease prevention and eliminating health disparities. Moreover, the Academy has evolved into a highly credible urban health think tank, working with elected officials and health professionals at the highest levels of government, including our pivotal role in helping to bring about much-needed reform around the state’s draconian Rockefeller drug laws. Our international work, particularly in the area of healthy aging, has propelled the Academy as a major thought leader in the drive to create age-friendly cities and communities – working with international partners to replicate our work here in New York. Our evidenced-based research on the correlation of sugar-sweetened beverages and obesity served as the basis for a state-wide campaign to launch a tax against such products. And we continue to analyze and evaluate work in HIV-AIDS research, which is often presented at national and international symposia. 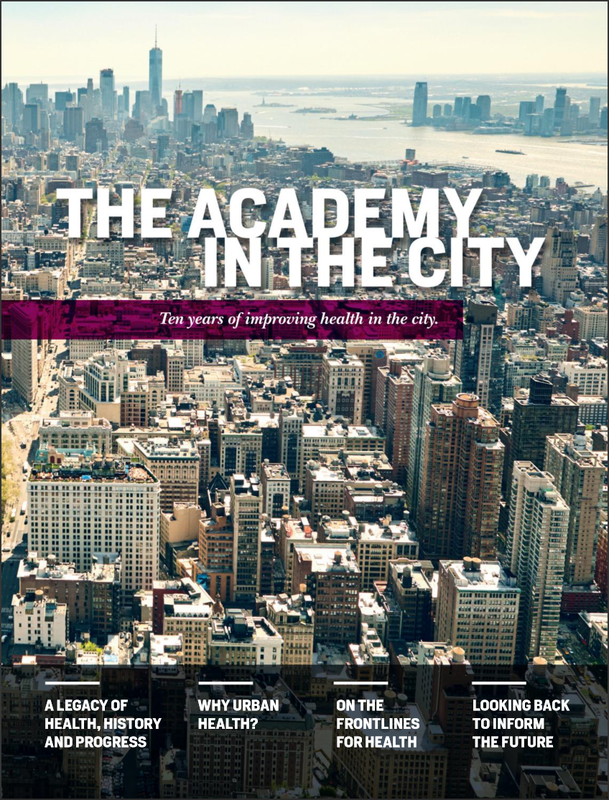 The theme of service to the public has always been fundamental to the Academy’s work, and, throughout its existence, it has produced nonpartisan, evidence-based reports and led courageous action on some of the most contentious health challenges facing New York City, the nation, and the world. The Fellows of the Academy have been one of its core strengths since the beginning, embodying the highest levels of achievement and leadership in the fields of medicine and health as well as science, social work, nursing, education, law and research. Throughout the Academy’s history, its Fellows have gathered to share research and pool their collective knowledge and experience to advance their respective fields as well as the health of the public. Since its founding in 1847, the Academy has held an Annual Meeting of the Voting Fellows in order to provide a time for the Fellows to convene to address important business matters including the induction of new Fellows and election of the Board of Trustees. Another rich Academy tradition is the Anniversary Discourse and Awards Ceremony, which in 2008 was combined with the Annual Meeting, making for one centerpiece event for the Fellows and Members. The Academy’s first anniversary, November 10, 1847, was marked by an oration delivered to an audience of 2,500 people at the Broadway Tabernacle by Dr. John W. Francis. This tradition of an annual discourse on an important issue of the day has continued for 162 years. The Academy has been awarding a medal for distinguished contributions in biomedical science since 1929. The medal for distinguished contributions in medicine was established in 1992 and named for John Stearns, the first president of the Academy. The first medal for distinguished contributions in public health, named for Stephen Smith, an Academy Fellow and pioneer in the field of public health, was given in 2005. In 2008, the Academy established a new award for distinguished contributions in health policy. Exceptional service to the Academy has been recognized since 1952 with an award of distinction. Today, the Academy’s Fellows are working at the highest levels of our nation’s public health system, as leaders of the Department of Health and Human Services, the Centers for Disease Control and Prevention, the Food and Drug Administration, and the National Institutes of Health, to name a few. In January of 1847, the Academy Library began with the gift of a three-volume set of Medical and Physiological Commentaries by Martyn Paine, one of the founders of the Medical College of the University of New York City. The Library was originally intended for the use of the Academy’s own Fellows, but it opened its doors to the general public in October of 1878. By then the collection had grown to more than 6,000 volumes and was on its way to becoming one of the foremost private medical collections in the United States. The Library enjoyed its most dramatic growth spurt during the last part of the nineteenth and early twentieth centuries, increasing its collection largely through personal and institutional gifts, including the collections of the Medical Journal Association, Society for the New York Hospital and the medical books of the New York Public Library. Historical collections rapidly became one focus of the Library's collecting interests. In 1893, when the Society of the New York Hospital voted to disband its library and presented the Academy with over 23,000 books, a large number of these became part of the rare book holdings. The rare book collections were then greatly enhanced in 1928 by the purchase of the Edward Clarke Streeter Collection, considered one of the finest private rare medical libraries in the world, from the Philadelphia bookseller A. S. W. Rosenbach. The collection has continued to grow as a result of donations and purchases, and now contains about 32,000 volumes dating from the 15th through the 18th centuries, as well as manuscripts, archives, and secondary reference materials about the history of medicine and the history of books and printing.